My kids and I took a eight day, 2350 mile round trip by car to Niagara Falls, Ontario. Along the way we visited each of the Great Lakes. The map below shows the route. The price of gasoline during the trip averaged about $3.15 per gallon U.S. We travelled through Chicago, which was a mistake because of the road construction. We drove nonstop until we reached the mid-Chicago. I bought gas there, but was chagrined because the gas station didn't have a bathroom. I suppose for safety they didn't want the locals stopping by the station. Make of that what you will. There was a youth group dodging traffic and selling bottled water from the middle of a very busy road that went over the interstate and bordered the gas station. I had to marvel at both their determination and their puerperal vision. 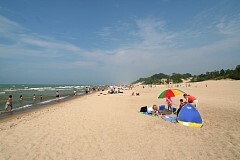 We are at B - Lake Michigan location on the map, which is the Indiana Dunes State Park near Chesterton, Indiana. 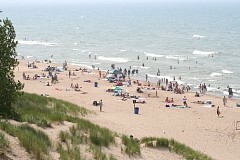 The park includes three miles of beach along Lake Michigan. The park was created in 1925 along southern Lake Michigan's lakeshore and features the world's largest freshwater dunes lining the lake. In several areas, huge "living" or "moving" dunes are slowly being blown inland, burying forest land as they go. 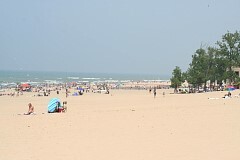 Indiana Dunes State Park is surrounded by Indiana Dunes National Lakeshore, a federally administered park comprised of approximately 15,000 acres of beautiful and diverse landscape. 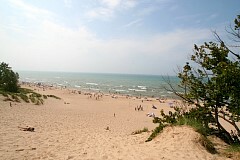 The beaches were formed by winds coming off Lake Michigan, which drop sand when the wind hits plants, dunes, and hills. As the lake level of Lake Michigan dropped at the end of the Ice Age, the shoreline receded, and new dunes were formed along the lakeshore. Vegetation took over the previous dunes, and eventually forests grew on top of them. My kids check out the water. 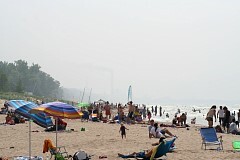 If you enlarge these pictures you get a good perspective of the beach looking east. 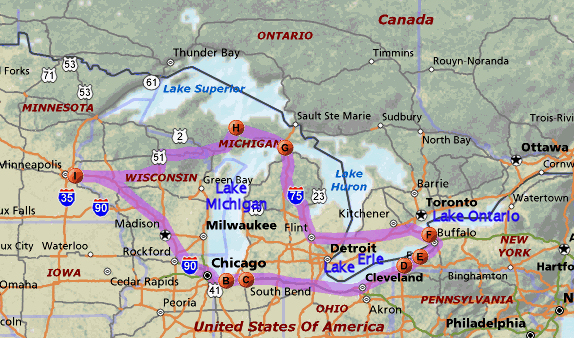 Here in 2007 the water level in the top three Great Lakes, including Lake Michigan, are far below normal. Since 1999 the levels of Huron and Michigan have dropped three feet. One-third of Lake Michigan boat ramps are unusable. One theory is that gravel mining and dredging in the St. Clair river in the mid-1960's widened and deepened the St. Clair River, through which Lake Huron (and therefore Lake Michigan) drain into Lake Erie. This flow has steadily eroded the riverbed, which in turn has steadily increased the outflow - more than can be replentished by rain or snowmelt. If this theory is correct, 2.5 billion gallons a year are being lost through the expanded parts of the St. Clair. This is the view looking west. It's over 90 degrees out and very humid. If you enlarge this and look in the distance you will see several large industrial smokestacks. I think U.S. Steel owns the shoreline containing the stacks. We spent the first night in South Bend, Indiana. There was no big reason for this, the mileage just worked out. Before the sun set we drove to the campus of Notre Dame university to look around. I was surprised that the campus did not impress me. For instance, I think the central area of the University of Minnesota is more impressive than the corresponding area of Notre Dame. C - South Bend, Indiana. 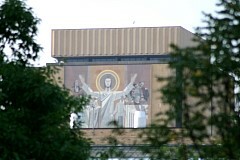 Here at Notre Dame campus, visible from the football stadium, is the mural known as 'Touchdown Jesus'. The figure is actually titled Christ the Teacher and the mural's official designation is the Word of Life mural, because it is a representation of a passage from the Bible in the Book of John. The mural designed by Millard Sheets is on the southern face of the tower of Hesburgh Library. The artist was commissioned to create a work large enough to be visible from the football stadium. Its theme was to be saints and scholars throughout the ages; this was suggested by Father Hesburgh. The mural was revealed during a ceremony held on May 7, 1964. The mural is composed of 324 panels, of which 189 are precast panel units. The remaining 135 are solid granite and Mankato stone, used for background panels. In all, 81 different stones, in 171 finishes, and from 16 countries, were used in fabrication. The following kinds of stone were utilized: 46 granites and syenites; 10 gabros and labrodorites; 4 metamorphic gneisses; 12 serpentines; 4 crystalline marbles; and 5 limestones. By strict definition it qualifies as neither mural or mosaic; the process is a unique one in which 6,700 separate pieces of granite were used to create the composition. With its large size (134 feet high and 68 feet wide) and highly visible location, it continues to attract attention, and helps to make the Library among the most familiar of the campus landmarks. Notre Dame stadium, which opened its gates in 1930, was expanded from 59,075 to 80,795 seats in 1997. Expanding the stadium has had the side-effect of partially obscuring the view of Touchdown Jesus from the field. We walked over to view the golden dome. 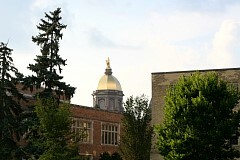 The golden dome on top of the Main Administration Building at Notre Dame University is covered in real gold leaf. Constructed in 1879, the building was designed to house the entire college. The dome was added to the Main Building in 1882. 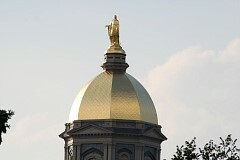 The golden dome has a 16 foot tall statue of the Virgin Mary on top. The dome is not required to be re-gilded after a certain number of years, but only as-needed. The re-gilding process consists of applying 3,500 square feet of 23.9-karat gold leaf. The process is done by hand and the material, which includes eight ounces of gold, can only be applied on dry days without wind.